Today I saw the scariest thing on Facebook… a bunch of creepy looking girls in dollface makeup and photoshop. I even saw a tutorial video explaining how to make your face look like a doll.. voiced by a squeaky voiced girl. I tried to follow the instructions, but I was far too lazy. I got lost after the part about the fifty gazillion tons of under eye concealer it was going to take to make it look like there were no lines under the eyes. I have actual bags under my eyes, so I figured I’d need like… 20 times as much. So I used Photoshop instead. You know what’s messed up? Even with Photoshop, you can still see bags under my eyes. Oh well. That’s it right there… isn’t it eerie? I know it’s giving me the creeps. to look serious, I look like I’m extremely pissed off. Dolls have blank expressions – they don’t look like they want to kill you. Except in horror movies, of course. So many of my photos looked pissed off, that I decided the better thing to do was to try for a Bride of Chucky kind of doll look… wow, that’s much better. 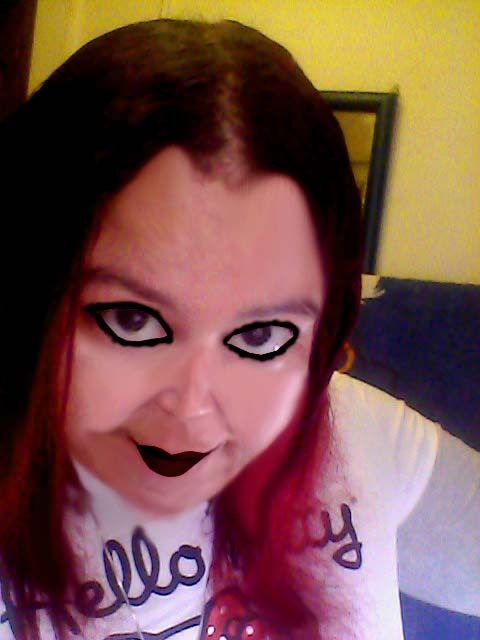 Yep… a lot easier to make me look like Bride of Chucky, with Photoshop I mean. I kind of wonder why all of those other girls they were showing on Facebook weren’t more interested in going for the Bride of Chucky look? What? They weren’t using Photoshop, you say? They really look like that first picture in real life? Oh… okay. Sure. You’re probably right. I thought it would be cool to write a story about a homicidal doll-faced girl: I mean, they have stories about homicidal dolls, why not a homicidal girl pretending to be a doll? It would be like Mannequin, The Evil. Yes. 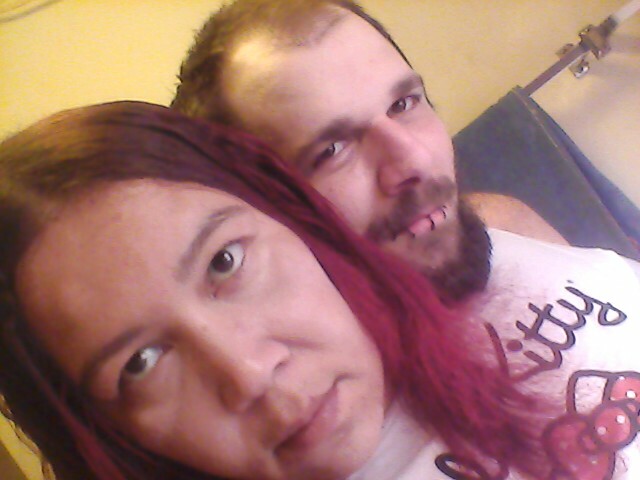 By the way, my fiance Greg couldn’t understand why I wasn’t smiling in the pictures, so he kept bugging.. erm, “helping” me and trying to get me to smile. No, he isn’t wearing the Hello Kitty t-shirt, that is an optical illusion. Unretouched photo of me, with Greg behind me trying to get me to smile. 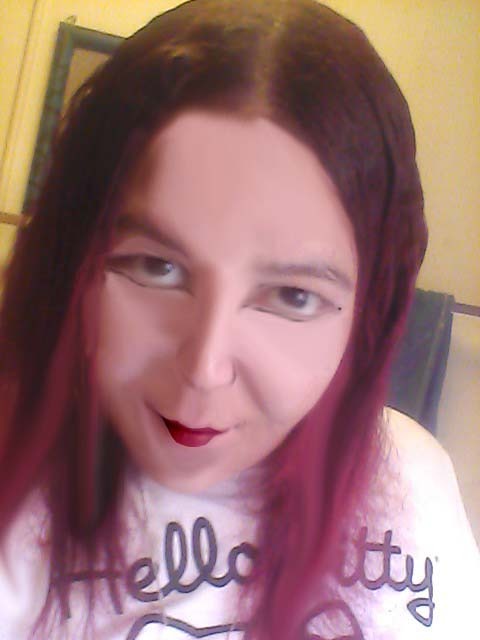 To their credit, the few Dollface chicks who admitted to using Photoshop as a part of their beauty regime are a lot better at it, and more subtle about it than I am. Of course, we can only imagine that they are 1) not actually parodying themselves, 2) not 44 years old and 3) not weighing in at 230 pounds. This was a parody… here are some REAL dolls. ~ by Sumiko Saulson on June 27, 2012. Admittedly creepy is the doll face look. I’ll be REALLY scared if they go for the clown look!